Three persons have been whisked away by police from the polling unit in Adewale street, unit 17 Alekuwodo. 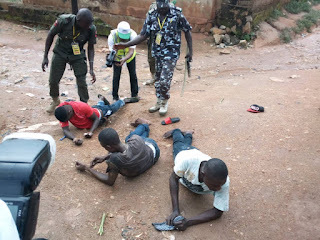 The affected persons, a woman and two middle aged men were allegedly in possession of voter cards belonging to other polling units. Agents of some political parties had raised alarm over the presence of the persons, whom they accused were not registered voters in the unit. However, security operatives intervened to bring the matter under control by taking the individuals away. Similarly, voters across Orolu community in Disu Oke-Odo area ,ward 7, Kajola road on Thursday were allegedly stopped by people suspected to be political thugs. The thugs were said to be fully armed and were shooting sporadically in order to scare and prevent voters from reaching their polling units. Hon. Oludele Adesoye, former supervisory Counsellor for Education in Orolu, told newsmen that his people were chased away by some unknown thugs who were armed with heavy weapons . Adesoye said , ” My people came out as at 6:00 am heading to their polling units but immediately we heard gun shots and later we saw armed guys coming from the bush. ” We had to escape for our lives and that was why you saw us here and trying to find our way to the polling units, ” he said.